Aquí les dejo mi guía para obtener la montura de pesca de wow legión. También pueden conseguir todos los juguetes y la mascota que da el conjurador de margoss. Espero les guste y sirva de algo. Found on the small floating isle to the Northwest of Dalaran, and accessible by going through the crack in the wall near the bank in that area of the city. Used the demon hunter glide ability to get there and see what if anything was there, and found Margoss wandering around with a small blue voidwalker named Blythe. He has a reputation bar and mentions fishing, but there doesn't seem to be a way to interact and gain faction with him at the moment. Attempting to fish in the pond gives a message that there are no fish there, and since there is no alternate way off without flight I jumped and glided toward Suramar to take advantage of the "Eyes of the Archmage" spell which warps you back to your hearth point if you try to get into an area you aren't permitted access to yet. edit: As others have mentioned, this NPC is now ready for business, and offers a few bobbers, a trade item, a pet and a mount as you increase your rep with him. So he's a mage that turned to fishing. I imagine the process involved him first trying to pyroblast fish to then capture them. When that failed, he decided to try and conjure massive water elementals to trap fish within them, which half worked because after that the elemental shunned his vicious fish-bullying ways and wandered into the wilderness to live in harmony with them. After that, feeling the sting of defeat twice, he instead decided to troll the fishing community that ostracised him for his unorthodox fishing approaches, thus he became the ultimate troll to them, requiring a consumable to be fished up before he will then deign to even decide if you're worthy of the trinkets he offers. The way to increase rep with him is to click on "I have drowned mana for you" or "I have 10 drowned mana for you." Drowned mana seems to drop fairly easily from fishing so it doesn't seem to be too tough. TIP #1: There are groups in the group-finder that fish together on Margoss' Retreat; this greatly increases the number of Marca de Aquaos that are fished up, and with enough people you can chain them back-to-back, increasing your rate of Maná ahogado acquisition dramatically! TIP #2: Take advantage of reputation buffs, like ¡WIII!/Chistera de la Luna Negra while the Darkmoon Faire is active, or similar buffs listed in the guide below during holidays to speed this grind up! Conjurador Margoss is a new Fishing-related NPC located on a floating island (Margoss' Retreat) around Dalaran. This island has a pool of water on it from which Maná ahogado can be fished up. As a Cazador de demonios, you can use Planear. As an Engineer, you can use a cloak with Parapente goblin attached. Any race/class can use Kit de parapente goblin (crafted by Engineers). Any race/class can use Vientos esmeralda (Toy obtained from the achievement Cría de la Garfa in Monte Alto). Note that any Maná ahogado spent on items from Conjurador Margoss will not grant any reputation. Conversely, any Maná ahogado turned in for reputation is consumed and cannot be used to buy merchandise. Maná ahogado can ONLY be fished up from the pool on Margoss' Retreat. A Fishing skill of 1 is sufficient to catch Maná ahogado. Fishing skill does not appear to appreciably affect Maná ahogado catch rate (see below). You can catch up to 2 Maná ahogado per cast. Other than Maná ahogado, only trash fish are caught on this island (Caballa plateada and Pez de colores grande de fuente). Maná ahogado can be turned in 1 at a time for 50 reputation or 10 at a time for 500 reputation. Maná ahogado is Unique (100) - as such you want to turn-in or spend it when you reach that mark. Level 110 is NOT required to fish up Maná ahogado. Testing with level 100+ characters has been successful; it is unknown whether even lower level characters can do so. Marca de Aquaos is an item you can rarely fish up on Margoss' Retreat (roughly 1 in every 100 casts). Using it will summon Aquaos el Desatado, an Elemental that will attack you, that you must kill. Aquaos el Desatado scales in health and level (like all Legion mobs). It is not difficult to kill him. Aquaos drops no loot, but killing him infuses the pool on the island with mana, increasing the catch rate of Maná ahogado to 100% while it is active for a short time! This state is indicated by blue mana motes rising from the surface of the water. Marca de Aquaos is Unique - as such, it is advisable to use it as soon as you catch one, to avoid not being able to loot any more you may catch. Of course, if the buff is still up on the pool from a previous kill, wait until it has expired before using another - prematurely using one DOES NOT extend the buff! While the buff is up, not only is Maná ahogado catch rate 100%, but you will somtimes catch various Legion (non-trash) fish, such as Rayatormenta and Salmón de Monte Alto. Overall this is a fairly low sample size; however, based on the information, it appears that Fishing skill has little to no effect on Maná ahogado catch rate. Further testing is needed to see if maxed fishing will yield different results. There is a one-time quest (Maná ahogado) that you can complete by fishing up and turning in 1 Maná ahogado for 250 reputation. Thereafter, the only way to obtain further reputation is to turn in Maná ahogado for 50 reputation per mana. *Each level of reputation requires just over 152 Maná ahogado with a single 10% buff. Stacking buffs will further the effectiveness. Consumed on use. Increases your chance to catch bait in the Broken Isles by 100% for 10 min. These baits are used to fish up Rare fish for the achievement Pezqueñines no, gracias. Battle Pet. Aquatic. Adds the Battle Pet Cría de raya látigo to your collection. Battle Pet. Critter. Adds the Battle Pet Basurín to your collection. Cajón de corchos: cabeza de múrloc and Cajón de corchos: pato de goma - 599 Maná ahogado required for one, 699 Maná ahogado required for both. Oddly, the reputation bar lives under 'Classic'. This has now been fixed. Margoss is in the legion as expected. With the release of Legion and people concerned with rep rewards, Darkmoon Faire opening shortly after release will make some rep grinds easier. Here's to hoping that the DMF rep buff also works with Conjurer Margoss. Don't forget to use the carousel and the hats! If you want to be able to get to him when you want, get the Cometa de los Cuerno del Cielo de pluma de roc from Highmountain. Fast and easy to get. For druids with moonkin form trying to get to the island just use your Flap Ability: Tomo de los bosques: Aletear jumping off from the Battle Pet area in Dalaran. You'll land with plenty of time to spare and won't have the issues that you get from zoning if you try to use Cometa de los Cuerno del Cielo de pluma de roc. 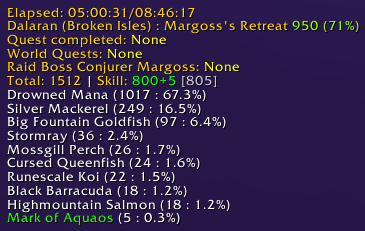 With only the human rep racial, it took me 784 Drowned Mana to cap out Best Friends with Margoss from Strangers. That includes the 1 I turned in for the initial quest. I find I can't even talk to him without him grabbing all my Drowned Mana - is this my addons or does everybody find this so? 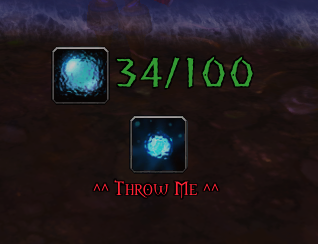 Here's a macro to count how many more drowned mana you need to turn in. Note, it does not count any in your bags until turned in. YES! I finally figured out how to get to this Island on my Priest using levitate. Using a Goblin Glider works well if you don't have this ability as well. Run, jump at the edge, hit levitate and glide over to the Island. Thank you jjanchan for the helpful guide to complete the quest & reputation! Took me about 5 hours to get from Stranger to Best Friend and get both the mount and the pet. If anyone who want to do this on a single day wants to know how long it takes. It is incorrect you cannot catch anything except trash fish such as the Big Fountain Goldfish. I was catching Highmountain Salmon, Black Barracuda, Silver Mackeral, Stormrays, and Mossgill Perch in just a few minutes worth of fishing. I also some some Stingray thing, but it's not in my bags, and I haven't figured out where it disappeared to, despite having gotten an achievement from it. When you go to his island, sometimes his apprentice, Blythe, will whisper you, 'Take me with you. Please!' I can't interact with it and Margoss himself currently has no conversation options related to it for me. **I added RiokaR's suggestion from comments. Next Level now shows the remaining points to next level. I love the chubby raccoon that dives into the pond and swims around. It would be awesome if he occasionally grabbed a fish--maybe one of the ones you catch! Finally got everything I wanted from this guy! Got the Briney shark (mount), the Sting Ray Pup (pet), and the crate of murloc heads (toy). Total of 1085 Drowned mana. about 16 of those coins that invoke the elemntal. Total of 1616 fish, about the same amount of casts (bkoz some get frozen, offline, wotever). Took two days of constant fishing, with or without anyone else around. Statistically, about 1:1 Silver Mackerel to Drowned Mana. As I have been fishing this island for a while now I notice that the reputation costs are the same for each level. 8500 gets you through each one. I'm getting 550 points per 10 drowned mana. It is taking a while but I'm almost done. Went from zero rep all the way to best friend (and bought the mount) yesterday in one shot. Took about five hours of fishing without breaks in a full raid group so the elemental buff was on the water nearly 100% of the time. Seriously don't do this by yourself unless you want it to take at least twice as long. Happy grinding. As of 15/1/17, using Balsa de pesca de pescador while on the small lake grants water walking instead of the raft showing up. Not sure if this is working as intended. The buff still shows as Anglers Fishing Raft though. Forgive me if this is old news, but I finally got this guy to best friend, and only after buying the Pez de fondo hondasal did I realize that it requires Best Friend with him. Then I looked, and the two toys and the two pets also require some rep with him. SO, with that said, if you are planning on grinding this guy for toys/pets/mounts to share, be prepared to grind at least a little bit on your alts. He is located on a floating island just north of Dalaran in which is not on the tradiontal map. You can use Kit de parapente goblin or Emblema de Margoss to reach the island, unless you have flying. This will take anywhere from 3hours to 12hours+ depending on fishing drop rate of Maná ahogado and if you take no breaks. Marca de Aquaos is important as you throw it in and Aquaos el Desatado will be summoned. Once he is killed there will be a 2minute buff for the area increasing the fishing drop rate of the Maná ahogado about 1-2 per cast at that point. That is why its crucial to find a party and immediately toss in Marca de Aquaos once you have it to gather resources faster. Once you reach Best-friends with Conjurador Margoss you will then need to exchange 100x Maná ahogado for Pez de fondo hondasal. He also has other stuff like a pet you can buy with Maná ahogado. NPC Conjurer Margoss is selling Mount, Toys and Pets. To get them you need to increase reputation with him - for increasing reputation we need Maná ahogado with you can fished up on small island North West from Dalaran behind Tournament Announcer. Your fishing skill to catch Maná ahogado can be 1-800. Maximum stack of Maná ahogado in your bag is 100 you will not catch more, you need to spend them for items or reputation to catch more. Maná ahogado finish this Quest to get 250 reputation. Maná ahogado x1 = 50 reputation with out any buff. Maná ahogado x10 = 500 reputation with out any buff. Don't wast your Maná ahogado for Cebo Arcano, Corcho de múrloc, Corcho de pato chillón you don't need to but it if you want to finish it fast even buff is not changing any thing. And last calculation: If you want to have all Toys, Pets and Mount you need to catch: 1240 Maná ahogado. Warriors can reach the island without a glider by jumping off the edge closest to it with a mount and using heroic leap. It has a small window of time but it was fairly easy to pull off. So, if you came here looking for answers on "How much Drowned Mana do I need per friendship level? ", like I did, and can't find a clear answer, I rounded up the reputation from 8,400 (it's a stupid number anyway) to 8,500. 8,500/500 = 17 Turn-ins of 10. 17*10 = 170. You will need just under 170 Drowned Mana (keep in mind that there is a cap of 100 that you can have on you at one time) PER FRIENDSHIP LEVEL. Here's a Conjurer Margoss rep script you can run in your chat window to see how much rep you have, and how much rep you need to be maxed out. Thanks to kniali for the macro setup! FYI, you can leave the fishing raid and still fish from the buff pool as others toss in marks. There is no need to start additional raid groups. The more people the merrier! Otrora estudiante del Kirin Tor, Margoss se ha pasado a la pesca para relajarse de su estresante vida.